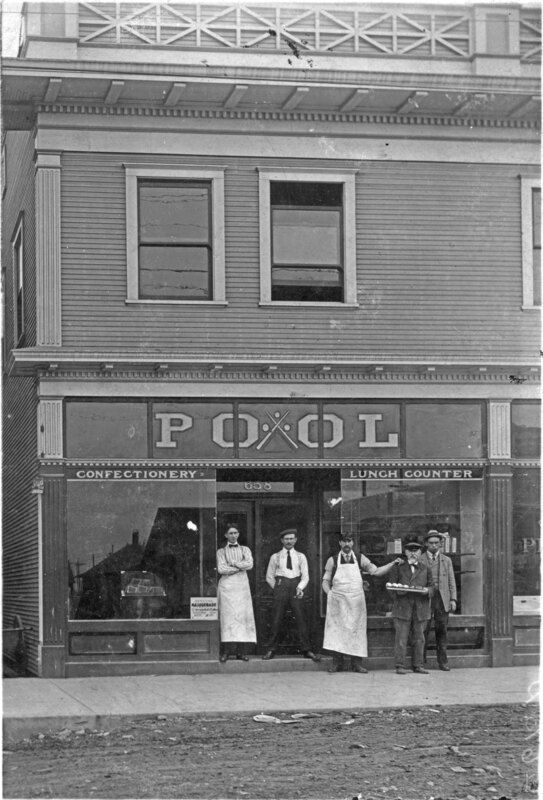 Here’s another outstanding turn-back-the-clock view of a business on NE Alberta Street: George and Sylvia Ford’s Pool Hall, Lunch Counter, Confectionery and Cigar Store, mid-block between 17th and 18th on the south side of Alberta, taken in September 1909. Click into this photo and have a good look around, there’s so much to see. 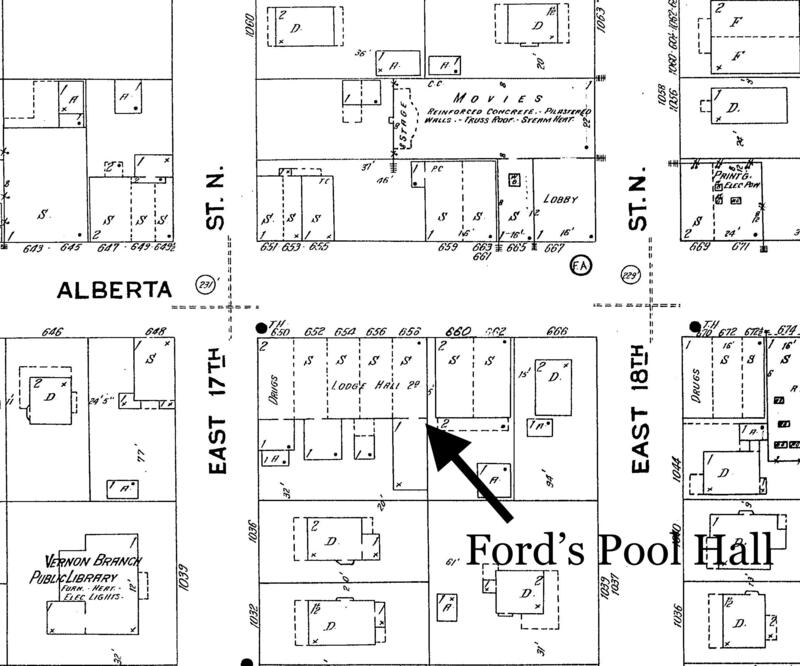 In front of Ford’s Pool Hall, 658 Alberta Street, 1909. Photo courtesy of the Gholston Collection, used with permission. Click to enlarge. Things that jumped out at us: reflections in the windows showing the north side of the street; the faces and clothing of the men; the small advertisement in the left window advertising the “Special Masquerade” on Saturday evening, October 9th (that’s how we know this is 1909); that’s George Ford, by the way, in the middle of the group in the apron with his hand on the older gentleman’s shoulder. We guess the confection guy is on the far left in the bowtie and the cigar guy is holding the cigar. George and his friend (is he the baker from next door?) might be running the lunch counter. 1718 NE Alberta, formerly Ford’s Pool Hall. November 2018. When Norm sent this one along, he knew it was on Alberta. And we could see the address over the door—658—which translates to today’s 1718 NE Alberta. Remember that all of Portland’s addresses were changed in the Great Renumbering of 1930-31. With the current address in hand, we went out to take a look, and that’s when this got a bit puzzling because the next door neighbor building to the east—the one that houses Earl’s Barbershop—has many similar features to the building in the 1909 photo. Look at the dentals under the first and second level soffits and the short horizontal brackets that support them; the column-like pedestals along the building edges. On first glance at that block today, you’d say Earl’s is the right place, especially when you look at the modernized front of the Maggie Gibson Plaza building just to the west. 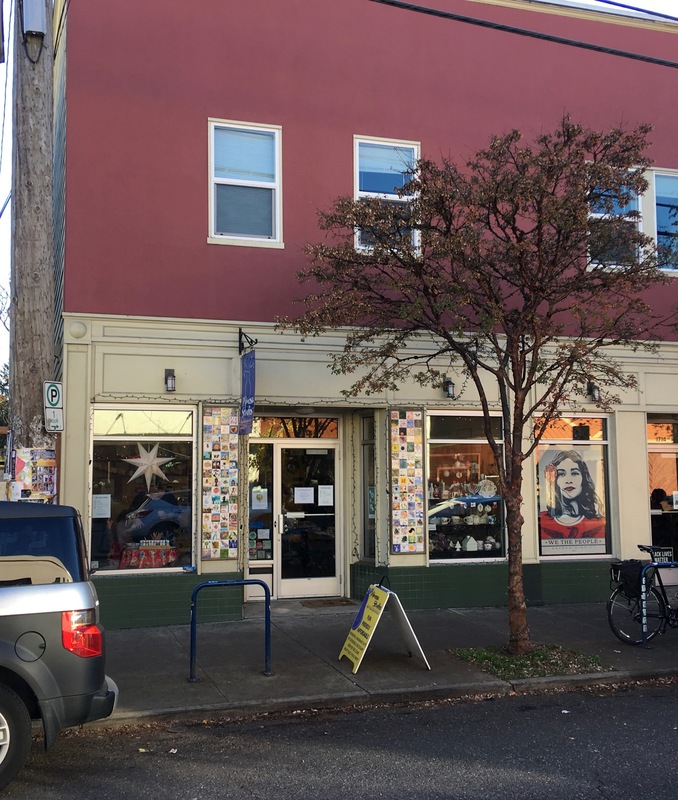 Both buildings are owned today by Portland Community Reinvestment Initiatives, Inc.
South side of NE Alberta showing the entire block between NE 17th and NE 18th. Maggie Gibson Plaza building (on the right) once housed five distinct store fronts on the first floor and a large meeting space known as Baker Hall upstairs. In later years, the space was home to the Royal Esquire Club of Portland. Photo taken in November 2018. Click to enlarge. But that notion doesn’t hold up when you dig into the details of building permits, city directories and old newspaper stories. 658 was clearly housed in the building to the west (right). Interesting to note that both were built in 1909 by the same builder for the same owner. Our hunch is they probably looked alike way back when. The clincher is the old Sanborn Fire Insurance Map from 1924 (below), which shows all of the side-by-side stores in both buildings. You’ll find 658 on the east end of the Gibson Plaza building and there’s five feet of space to the next neighbor to the east. Remember that these maps were drawn primarily for fire insurance underwriters, so they show building proximities, location of plumbing, fire alarm systems, heating systems. S = shop; D = dwelling; FA = fire alarm box; F = Flat. Detail from Sanborn Fire Insurance Plate 550, 1924. Click to enlarge. 654 Grite’s Barber Shop and entrance to Baker Hall, which was upstairs. Encompassing the second floor of the building was an open meeting space known as “Baker Hall,” which in the early days was where the Alberta Oddfellows Lodge met before building their own space, and in later days the first home of the Royal Esquire Club of Portland. In the 19-teens, Baker Hall was the frequent site of lectures, dances and community meetings. The house on the corner to the east—addressed as 666 in the Sanborn plate—is still there today and was Freda’s Beauty Shop and home to Freda Baker. 661 Alberta Sheet Metal Co. The FA in front of the Victoria Theater was a fire alarm pull box. 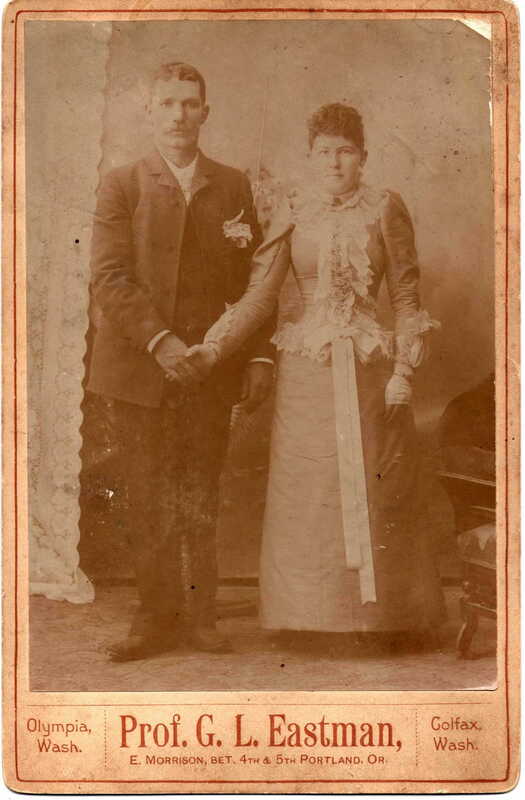 George and Sylvia Ford, October 26, 1892. Photo courtesy of Ford family. Geo P. Ford, who has conducted a cigar and confectionary store at Alberta and 21st Ave., for a number of years, and an old resident of this district, passed away at his home, 4925 N.E. 19th Ave., last Friday, at the age of 74 years. He leaves to mourn his death, his wife, Sylvia Ford, and two sons, George and John Ford, and several brothers and sisters. Funeral services were held Monday afternoon, Vault entombment, Riverview Abbey Mausoleum. Heartfelt sympathies goes out to the bereaved family in this, their sad bereavement. We’re ready for the next photo mystery. There are more than 200 articles here containing hundreds of photos, documents, maps and other items related to the early history of Northeast Portland neighborhoods. Check out our list of favorites or select a category to begin exploring. Enter your email address to subscribe to Alameda History and receive notifications of new posts by email.